This was a book group read and it was my suggestion, yet when one of the other members asked why I’d chosen it, the only reason I could come up with was that I couldn’t remember anything about it. 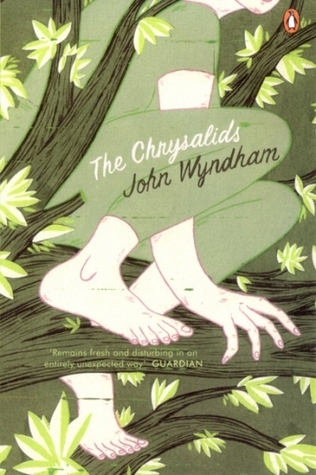 I’ve read many of Wyndham’s books, like The Day of the Triffids, The Midwich Cuckoos, The Trouble With Lichen and Chocky, and I have vivid memories of them, but The Crysalids? Not so much. Turns out there’s a reason for that – I’ve never read it before. Several others in the group were in the same position, avid Wyndham fans but hadn’t read this one. We’re all of a certain age, so it made me wonder whether it was regarded as subversive in its day, and not sold as widely as some of the others. The premise is that there’s been a nuclear holocaust at some time in the past. Large swathes of the earth are uninhabitable because of the devastation and radiation, but there are small pockets of humankind who have managed to cling to life. Mutations are a constant challenge, however, and the different groups have developed different ways to deal with them. The society we’re initially shown is striving to maintain (or return to) a ‘pure’ form of humanity and deviations are ruthlessly dealt with. A whole fundamentalist religion has grown up around this principle. The main character, David, is the young son of the leader of one particularly devout group, living a precarious existence close to the edge of habitable lands. David meets a girl of his own age, and accidentally discovers that she has a deformity – an extra toe on each foot. Such a tiny difference, yet in David’s community, she would be put to death, or exiled to live an even more precarious existence in the badlands where mutations run wild. And when the reader is still pondering this issue, we discover that David is harbouring a bigger deformity than an extra toe – he and a group of far-flung other children have a form of telepathy, which allows them mental communication over a distance. Eventually, as David and his friends grow up, things get difficult and they have to make terrible choices – to deny their ability and try to pretend they’re normal, to hide it from normal people or, if all else fails, to run away. And when they’re forced to run, they begin to discover all those other groups that have very different ideas about radiation-induced differences, including groups which celebrate and try to develop them. This is a book that’s stuffed with ideas, some of them almost casually thrown in as an aside. It could have stood to be a little longer, to develop some of these ideas more fully. It’s also stuffed with a lot of proselytising, where one or other character simply sits down to explain, at great length, some scientific or philosophical point. I could have done with less of that, frankly. And the ending is shocking, in a number of different ways. But on the whole, the writing has held up pretty well, the story was absorbing and if the characters sometimes felt like ciphers, the action moved swiftly enough to paper over any cracks. A surprisingly good and thought-provoking read. Four stars.